The ideal B&B where you can fully enjoy your vacations without spending an extra dime, centric, quite and comfortable . Casa Blanca is a nice colonial casa particular in Havana Vedado which belonged to my grand parents since 1920 when I was a kid. The casa has two floors, main one has a parking, the entrance with two terrace, a wide living room where you can watch TV or read a book, a dinning room where you can have your breakfast. The marble stairs lead you to the second floor, here are two rooms, and a terrace, where you will love to sit in the afternoon and night to chat and drink a beer or Cuban cocktail, you have a minibar with soft drinks, bottled water and beer. Colonial house, 1920 style, old furnitures, terrace and portal with diverse ornamental plants, well located, near restaurant, stores, historical places, safe and quite neighborhood, close to old Havana and the "El Malecon Habanero". Professional massage is an option. 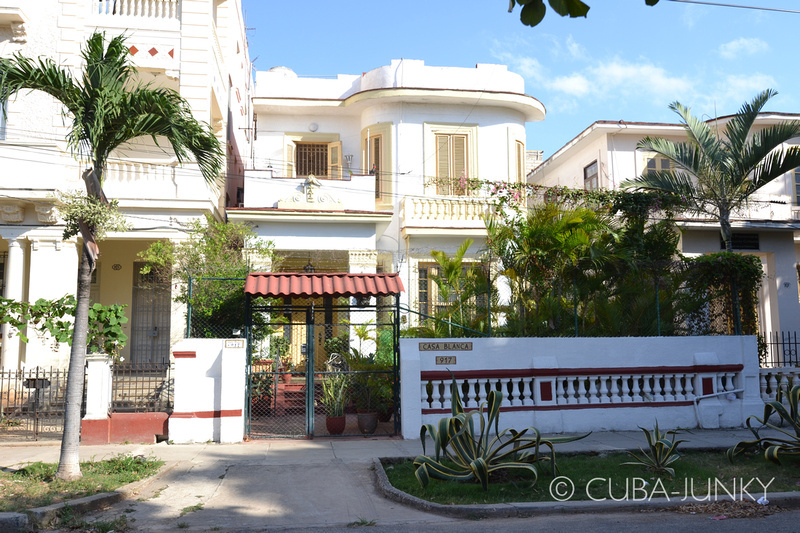 Casa Blanca lodging is an ideal place to spend romantic vacation in Cuba. We so enjoyed a memorable time in this beautiful, comfortable, 2 story colonial home with balcony & minibar. It was walking distance to restaurants stores, Old Havana & the Malecon. Many lovely, ornamental plants surrounded the home & best of all, hosts, Jorge & his beautiful wife, Yanixa, lavished us with fabulous Cuban hospitality, delicious breakfasts & help with anything one might need or want to see. Casa Blanca was booked up when we returned from a trip to Vinales, but Jorge immediately found us another B & B with friends of his. How was your room? :	Lovely, comfortable & had adjoining ante room & balcony. Nice bathroom & everything very clean. How was the food they offer? :	Very good with beautiful fresh, tropical fruit as well as eggs, toast, tropical juices, etc. Other services they offer:	Arranging any tours, transportation, restaurant reservations, etc. Other comments:	A very serene, quiet atmosphere with lovely, soft music. We don't know if there was Internet for guests, TV, laundry service, private parking, bathtub, ceiling fan, dinner service or king size bed, as we never needed any of those amenities. Per motivi di studio sono stata spesso all'Avana, negli ultimi anni, e dopo avere girato molte casas particulares ho finalmente trovato questa, ed è qui che ormai torno ogni volta. La casa è bella, confortevole e pulitissima, con un bel giardino e una grande terrazza al piano di sopra. Le stanze sono comode, col frigo, e la colazione è ottima e abbondante. Il caffè è squisito. Ma, soprattutto, Jorge è una persona su cui si può contare: disponibilissimo, serio, preparato, affidabile, discreto e capace di aiutarti a risolvere tutti i mille problemi e contrattempi in cui si può incappare a Cuba. Una persona cosmopolita e profondamente perbene. Per me è una certezza e un punto di riferimento. La casa è nel quartiere del Vedado, il migliore dell'Avana, quindi centrale ma senza tutti gli inconvenienti dell'Avana vecchia, con mille punti di interesse a portata di mano e ottimamente collegato a tutti i mezzi di trasporto. Insomma: consigliatissimo, di cuore. CASA Blanca is a beautiful and homey colonial casa located in a safe and quiet community, it is safe walking to the ocean and the nice neighborhood streets at the night and day, convenient to get on the hop on-off city tour bus in a few blocks. There are a few authentic traditional cuban cuisine and modern fusion restaurants nearby. Inside house we learned a lot of cuba history, art and culture with surrounding old style furniture, handcrafts and sculptures made by original owner(Jorge's grandfather), pictures of famous Havana architectures and movie "CASABLANCA" posters, etc. The guest room is clean, comfy with all the necessary amenities, water and beverages are kept cool in a small refrigerator, a safe-box is available. We highly recommend it to our relatives and friends. The owner, Jorge, speaks perfect English, is extremely welcoming and friendly, and able to help with anything you might need during your stay, from directions around Havana and places to dine and sight-see, to traveling outside of Havana and making transportation/lodging plans. He has a great reputation among tourists and was referred to us from a tour agency in Grand Cayman, many of his guests are frequent re-visitors. He replied our email inquiries promptly and made explicit arrangement for us from airport pickup, city direction, dinning reservation to transportation plan to other cities outside Havana. Jorge is super kind and willing to go above and beyond to solve any unforeseen difficulties, we are so grateful to get countless help from him, our Cuban trip is especially memorable and unique because of him. Once again, we'll recommend Jorge to other travelers without any hesitation, he is the best! How was your room? :	The room felt very secure and clean, and everything was kept up-to-date. There are plenty public areas including a outdoor porch to sit down, one can enjoy reading, casual chatting with other travelers. No kids or pets. At the night, it's comfortable and quiet, we slept well during our stay. How was the food they offer? :	The breakfast is very nice, delicious cuban coffee with plenty fruits. Other services they offer:	Airport pick up and drop off, transportation and lodging in other cities outside Havana, Jorge knows many people and well connected. Other comments:	We hope to go back and stay again some day, truly appreciate Jorge's generosity and hospitality. This beautiful home in a lovely residential area nearby Parque John Lennon was a very homey and family friendly home with beautiful furnishings. Jorge is very knowledgeable of the tourist attractions and prices and can advise you where to go to purchase your entrance tickets for example to the Cigar Factory. The rooms are very clean and most of all, the breakfast was great and very fulfilling to start my day in Havana!! I recommend this over a hotel room any day. Taxi service is available down the street to get you to the city within 5 minutes. Other services they offer:	Local knowledge I found was a massive help, Jorge knows the area and the people and can arrange anything from airport pick to local hole in wall great eating spots. We got Jorge to help up with airport pick up , vintage car tours, taxi, and dining out which he met our needs every time . Other comments:	Casa Blanca is a must stay if your looking for a local stay just a few km out of the hustle of old town. Jorge makes your stay seamless Beautiful helpful man who can’t do enough for you. Casa Blanca 917 is a beautiful and comfortable place to stay in a wonderful location. The owner, Jorge, speaks perfect English, is extremely welcoming and friendly, and able to help with anything you might need during your stay, from directions around Havana and places to dine and sight-see, to traveling outside of Havana and making transportation/lodging plans. The location is well-suited for walking around night or day, visiting the ocean, live music, and exploring the beautiful streets of Vedado, or just sitting on the peaceful front porch/garden in the evening. How was your room? :	The room was very comfortable and well-stocked with towels and beverages. The fan and air-conditioning were very nice to have at night, although with the windows open there was a very nice cross-breeze as well. The room felt very secure and clean, and everything was kept up-to-date. How was the food they offer? :	The breakfast in the morning was ample and delicious, well-worth $5 per person. Other services they offer:	Help with booking transportation and lodging outside of Havana, directions around the city. Other comments:	We had a lovely stay and hope to stay again!